If you’ve been tasked with organising your company’s next event, then most likely you’ll be looking for a PA system to ensure that everyone attending can easily hear what the speaker is saying. Here at Conference Audio Visual, we want to make sure that you hire exactly the right PA system for your Melbourne event. So whether you’re organising an auction, an outdoor wedding, a sporting presentation or a special fund-raising event, we’re sure to have exactly the right PA system for your needs. 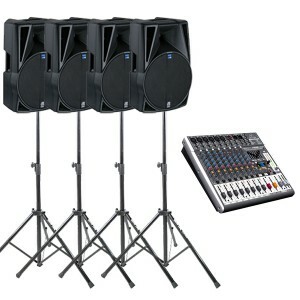 Here at Conference Audio Visual, we’re the experts in PA hire in Melbourne. All you need to do is come and have a chat with us and tell us all about the event that you’re planning. We’ll then put together a hire solution for you so that on the day of the event, you’ll have all the amplification of sound that you are going to need. We’ve been in the audio visual business for over 30 years so we know exactly what your next event is going to need. We’ve helped clients all around the greater Melbourne area get exactly the right PA system for their event. Whether it be an outdoor live property auction or a corporate training day, we’ve helped to make the event a success. When you hire your PA system for your next event you can be sure that you’re getting the highest quality equipment which is backed up with our technical expertise. We’ll show you exactly how you need to set up and operate the PA system or we also have experienced technicians available to assist you at your event if you feel that you need further help. 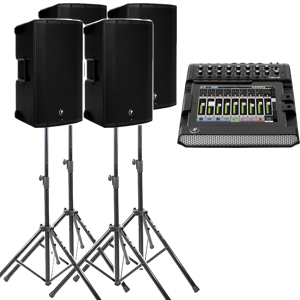 Our PA systems are also very affordable to hire, meaning you can concentrate on the other aspects of your event without having to worry about the cost of your audio equipment hire. If you want us to give you a quote on your PA system hire for your next event, you can simple give us a call. We’ll sit down with you and ascertain exactly which system is right for your needs and then provide a quote for the cost of hiring that system. We’ll also be able to suggest some other audio visual equipment that could be useful for your event such as maybe a lectern or some event lighting, but if you just want the PA system, then that’s fine too. To get in touch with us you can simply phone us on 1300 214 733 or send us an email with your requirements to enquiries@conferenceaudiovisual.com.au. We’ll get back to with a suggestion of what you’ll need for your event and a quote for the hire cost. To be successful, a corporate event needs to have a reliable PA system to ensure that anything you want to say can be heard. At Conference Audio Visual, we have the experience and the expertise to supply and set up the kind of PA sound systems that will guarantee that your event gets off to a flying start. 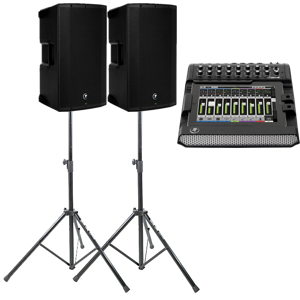 We offer some of the best prices for Melbourne PA hire and audio hire, as part of our package of top quality audio visual services in Melbourne. So, if you’re looking to rent a PA system, get in touch with us now, and let us show you how we can elevate the sound at your next event to the next level. Our professional team of audio visual specialists has over 30 years of experience between us in the business. 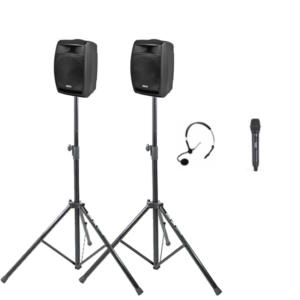 This means that you can be sure that when you hire a PA system in Melbourne with Conference Audio Visual, you’ll be getting not only some of the best deals on PA system hire Melbourne has available, but you’ll be getting top quality equipment backed up with our technical expertise. We’ve made it our aim to really understand exactly what your event needs in terms of AV support, and to implement a suitable plan to enhance the proceedings. Whether you’re looking for a PA system for an indoor conference or training day, or you need top quality portable PA system hire for an outdoor event, we can provide a tailor-made solution to ensure that you won’t suffer any sound issues. If you care about putting on the best show or event you can, you’ll feel far more confident with Conference Audio Visual in charge of your sound. We’ve a wealth of experience in providing sound systems for all kinds of events, from small conferences to large red carpet events. No matter how big or small the occasion, and whether you’re holding it in Melbourne, somewhere else in Australia or even further afield, we can help you to put on a show that everyone will remember. Our AV services are available Australia-wide and through our network of professional AV specialists, we can even provide our services internationally. We’re here to make your life easier by providing you with top quality PA equipment and the benefit of our years of expertise in providing AV solutions. Conference Audio Visual is Melbourne’s best audio visual company. We specialise in projector screen hire, stage lighting, PA system hire, Audio Visual and sound equipment & speaker hire. Hire a four Speaker Professional Sound System consisting of 4 x 10″ or 12″ Powered Speakers, Speaker Stands & Digital Mixer. Suitable for medium audiences of 80 – 200 people. Combine this package with any of our extensive range of microphones for hire. Package includes all appropriate cabling. These systems are popular for smaller to larger gatherings (10 to 150 people), such as weddings, as well as for use outdoors where power access may be an issue. With 100 watts of power per speaker, these PA systems are loud and clear and ideally suited for speeches and background music. The dual speaker 100W portable PA system comes complete with inbuilt batteries, giving you six to ten hours of use before requiring recharging. This system includes Bluetooth and USB connectivity enabling playback of music. 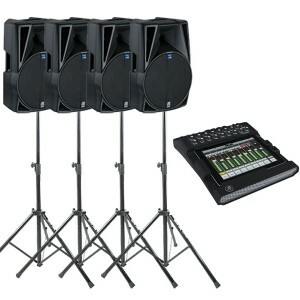 It can also accommodate two wireless microphones (hand held or head worn), which can be hired separately. This package includes all appropriate cabling. 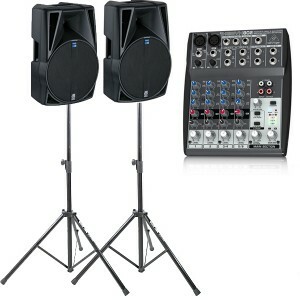 Hire a two Speaker Professional Sound System consisting of 2 x 10″ or 12″ Powered Speakers, Speaker Stands & Digital Mixer. Suitable for smaller audiences of up to 80 people. Small sound system including a 16 channel digital mixer, 2 speakers with stands, required cabling inclusive of setup and packdown. 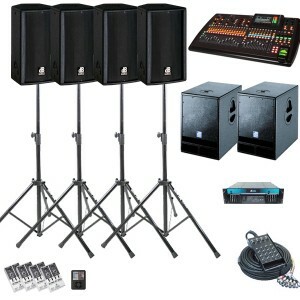 Small sound system including a 6 channel mixer, 4 speakers with stands, required cabling inclusive of setup and packdown. Small sound system including a 2 channel mixer, 2 speakers with stands, required cabling inclusive of setup and packdown. Plenary room audio package suitable for up to 400 Delegates includes 4 Performance Speakers with Stands, Sub Woofers, 32 Channel Digital Mixer, Multicore, iPod, 4 x DI Boxes for PC audio inclusive of setup and packdown.